Alas, Dennis Ritchie is no longer with us. But I don't see a Dennis Ritchie quote on Stack Overflow. Why is this so? I think he deserves it. Out of 100 programmers (Stack Overflow's audience last time I checked), I expect all of them to know. Not a rant, just an opinion. There has been no internal answer, what I offer here is my opinion; it is also the opinion of some of the other members of the team. Tributes to the dead are tricky business. Where do you stop and where do you start. Does Bill Gates get a tribute? Knuth? Larry Wall? Matz? John McCarthy? Chomsky? Norvig? Linus? Alan Cox? Bill Joy? Marvin Minsky? Woz? What about our own community heroes? Does passing a certain rep threshold ensure you get a tribute? And what about the already dead. Why not respect them? Where is Turing's 50th anniversary coming up in a few years? Babbage's 140th coming up real soon? Pascal? Von Neumann? Grace Hopper? Dijkstra? Cobb? We used a feature that was never designed for "dead people tribute" to give out a tribute and now are suffering the consequence. System messages were meant for emergencies, stuff like ... the website is going down in 5 minutes, be warned. That is why they can not be dismissed; that is why they are so prominent. When the Jobs tribute happened Jeff was away; the decision to put it up was Joel's. Jeff was not particularly happy that it went up, probably foreseeing the slippery slope this takes. For the record, when this happened I suggested going with a house ad. My rationale was, if this really is that important to you: lose some money. That shows respect. It was countered with a "it looks too cheesy". But even an ad has the same slippery slope. And too, like system messages, it is not designed as a respect dead people feature. When the Jobs banner went out, I had to spend a whole morning on damage control, ensuring huge blood baths between our members do not ensue and ended up locking a question. Unlike Turing, Jobs was not everybody's hero. Now, people want to have their programming hero to compensate. For the record I did support the Jobs message; in retrospect, I think that was a mistake. I think we should not be in the business of dead people tributes as it gets in the way of providing awesome answers to awesome questions, and brings in politics to a place that strives to stay politics-free. Stack Overflow is for professional and enthusiast programmers, people who write code because they love it. 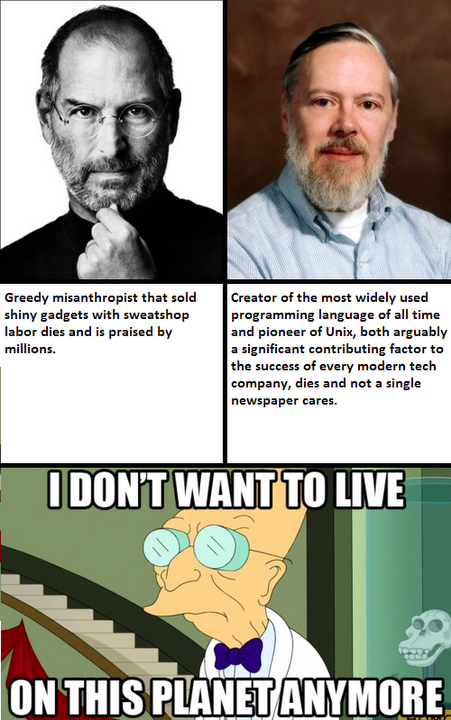 Jobs was not directly relevant to programming or programmers, no matter how many of them use iPhones or Macs. Ritchie created tools, which every programmer uses every day. Even those who use Macs and iPhones (they are after all based on UNIX and using Objective-C, which is build on top of C). Ritchie was not famous enough? Well, what better way to get people to read about his achievements, than by honoring him. In other words, my opinion is that SO team has no excuse for honoring CEO of hardware vendor, and not honoring one of most important creators of modern programming and modern operating systems. Create a tribute to them similar to the way we create open source ads. Describe why the person was awesome, what they did. Include a picture. This also has the benefit of showing to people who would appreciate seeing it. For instance, C, *nix, etc would be appropriate here. While yes, the banner for Steve Jobs did set a sort of precedence, I don't think it will be tenable going forward. NB This is not an 'official' response, it's just my opinion and suggestion. A half baked one, at that. Yes, I think we need to do something to honor Dennis Ritchie, now. I just don't want to do it using the system message bar again. I think it was nice to honor Steve Jobs on SO, but once you do it you have to do it for everyone else. There is no doubt that Steve Jobs was influential but arguably there are more influential people than Steve Jobs in the industry. So to avoid these types of posts in the future, I recommend that we not quote anyone in any banners on the site since that isn't the aim of the site anyways. Otherwise, you'll end up like Google and changing the banner almost daily to satisfy all the special groups and countries. I knew Dennis Ritchie casually, and he will be missed. But please, I would rather not see every occasion of someone's death turned into endless rounds of being voted "worthy" to be marquee'd in some sort of ritualistic death roll. When Steve Jobs died, the gesture was thoughtful and touching because it was spontaneous, heart-felt, and seemed appropriate for the moment. But it's sad when grand gestures elicit these "me, too!" reactions. It makes you reflect on ever doing them at all. If you want us to become the arbiters of "This person is at least as great as that person," the whole thing becomes sort of crass. Rallying and voting only makes the loss more poignant. Share your stories and reminisce how he affected your life — That's how you honor someone. Rallying around "WHERE'S HIS QUOTE!?" is not paying homage to anyone. Putting up system messages is a tricky business. They can't be dismissed and really should only be used for emergency / super-duper-extremely important notices. I think a nice place to put a tribute would be in the relevant tag wikis such as c and unix. This puts it fully in the hands of the community as it is the community that edits and approves tag wiki content. Unix is simple and coherent, but it takes a genius – or at any rate a programmer – to understand and appreciate the simplicity. I'm not convinced starting a habit of honouring passed industry notables is a good idea at all. But if the consensus is that the site should honour them - how about a smaller mention in a less prominent space (but still on each page)? To me, each dead person meaningful to other people deserves to be honoured respectfully. But I also think, that SO is not the right place for honouring, no matter if the person to be honoured is Steve Jobs, Dennis Ritchie or John Doe. Even though it makes me sad to hear Jobs and Ritchie are gone (which both influenced programming without doubt), I don't see SO as a news agency in the end. When I want the news of the world, I visit AP or Reuters, or read a newspaper. If I've a specific programming problem (or want to help at that), I'll visit SO. If the SE team decides to honour a specific person on one or more specific SE sites, it's clearly their right to do so, but it will of course raise endless "If you honour A, why don't you honour B?" discussions. To avoid this, I only can think of either not honouring anyone on any SE site at all, or maybe an Area51 proposal for something like obituary.se, where every user can honour the person they want to (though I'm not sure how many heated discussions posts in such site could produce). What do you call it when a brief, completely out-of-the-ordinary tribute launches a hotly debated discussion of the grievances served by lack of tribute to other deserving persons and new policy proposals (and even feature proposals) to prevent such "problems" in the future? Not the answer you're looking for? Browse other questions tagged discussion system-message . In what way did Dennis Ritchie influence you? Encourage field veterans to participate on SE more by imbuing them with an initial honorary rep starting point? What can the Stack Overflow community do to pay tribute to Dennis Ritchie?